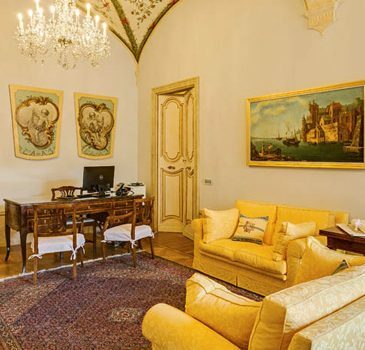 Just a few steps away from Piazza del Campo, in the heart of an ancient noble palace, the “Relais degli Angeli” has maintained the charm of a period residence but with all modern comforts. The elegance of the staircase made of travertine, the warmth of parquet on all surfaces, the beautiful frescoed ceilings: every component of the facility, under the protection of the Superintendence of Cultural Heritage, is cared for down to the smallest details in order to surprise you. On each floor, communal areas with large and comfortable sofas and well-stocked bookcases will allow you to rediscover the pleasure of a break in a family-like environment, also thanks to the presence of a refreshment corner with herbal teas, coffee and tea, available 24 hours a day.